Runners looked different in the 1970s. I’m not sure why. Was it because we believed “long, slow distance” was 7:30 to 8:30 pace? Or because there were so few of us? Or was it a question of style – the difference, say, between 1970s cotton and 2008 Spandex? Running was different then. If you passed another runner, which was rare, you waved and smiled. Male runners wore t-shirts or went shirtless. Gym shorts and jocks were not uncommon. There were, alas, fewer women runners. 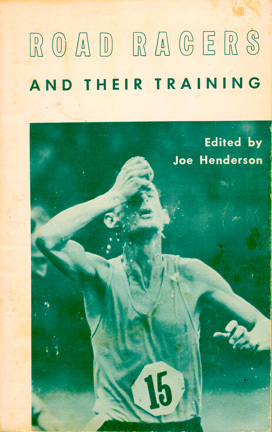 I reckon younger runners carry their own images of “the look.” The accompanying cover of Road Racers and Their Training, by Joe Henderson (published by Track & Field News in 1970) defines “the look” of the seventies. It shows Alan Phillips during his 50-mile world record race. 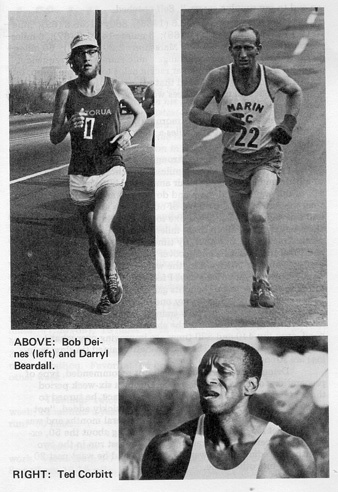 Below, there’s a Road Runners page with photos of Bob Deines, the then-US 50-mile record holder; Darryl Beardall, a northern California runner who trained 120 mpw for years while working as a railroad telegrapher, and who at one time ran a weekly 50-miler as part of his training; and the legendary Ted Corbett, who placed second in the famed London to Brighton race (52.5 miles in 5:38:11), setting the US 50-mile record in that race despite a 2½-mile handicap. What gave these runners the look? Was it that they were in peak condition, yet not as emaciated as the fish-boned Olympians? I’m not sure. But I do know that the photos evoke feelings for me. The look said that here is a person who’s supremely capable as a runner – someone who can never see a trail wandering up a hill without wanting to jump out of the car and discover where it leads. Here’s a person who finds a higher meaning when he runs – his thoughts in a groove, his legs awake with power, his lungs and heart cranking energy in a smooth and constant flow. Well, that’s my interpretation, and I’m sticking to it. Reflecting on the look, I realize it’s something I’ve tried to capture for 30 years. At 66, my odds are slim, but I can still aspire. I can imagine reaching that state of fine-tuned fitness – lean but not skinny, with big energy and a quiet feeling of…oh, well, yeah, gosh, let’s face it – superiority. I can imagine enjoying that flickering ego-satisfaction and then sublimating my ego to a greater joy. It’s just a dream, but it’s partly why I do speedwork and long runs and wear a heart monitor and tinker with my running. What does “the look” say about a runner? There’s not much enduring satisfaction to be found in the body. The ancient scriptures of India point out that the body has three “delusive deficiencies”: it is born, it changes, and it dies. The body gets sick, gets old, feels great one day, not so good the next. But a healthy, fit body can be a heck of a springboard for expansion of heart and mind. The satisfactions of a runner require balance, and I think that’s part of what defines the look. The guys in these pictures look balanced. They aren’t fat-free Kenyans or mesomorphic Dean Karnazes. Their look is normal – just very, very fit. These people may not be world champions, but they’re being the best that they can be. And that invariably makes a person magnetic. In a Fitness Intuition chapter called “What Runner’s Want,” I talked about the Mel Gibson/Helen Hunt movie from which I stole my chapter title. Gibson plays a cynical advertising executive who uses women, but can’t write ads for them because he doesn’t understand how they think. He falls into a bathtub with a hair dryer, and when he wakes up, he can hear women’s thoughts. It’s a funny movie that makes a powerful point. By expanding his awareness beyond his own selfish boundaries and embracing women’s realities, Gibson becomes a better man. He achieves balance, and it wins our approval.